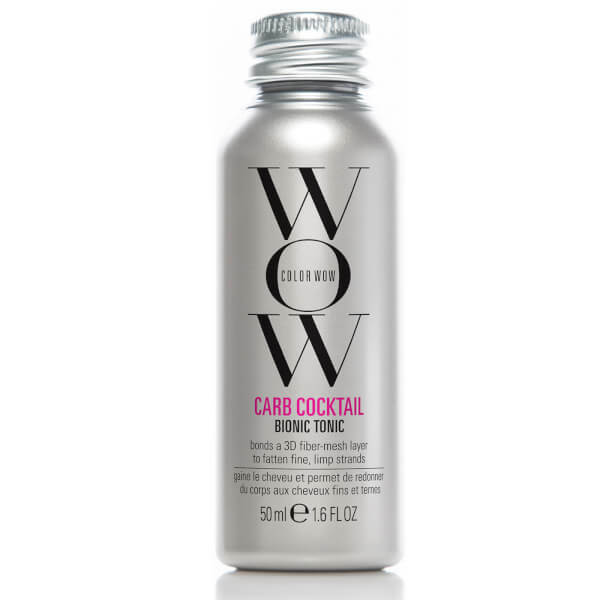 Enhance and fortify your hair with the travel-sized Color WOW's Carb Cocktail Bionic Tonic, a leave-in treatment that works to add body and fullness to limp, lifeless, colour-treated hair. Colour processing often causes hair to lose natural protein mass. To help combat this, the formula delivers a high-carb complex of Corn Starch, Cellulose and Oat Bran that binds to hair's surface to help boost the appearance of fine, lack lustre locks. It utilises a blend of Quinoa and Keratin Protein to create the appearance of thicker, full-bodied hair whilst imparting healthy, mirror-like shine. The effects of the starch-infused formula are enhanced when hair is heat styled. 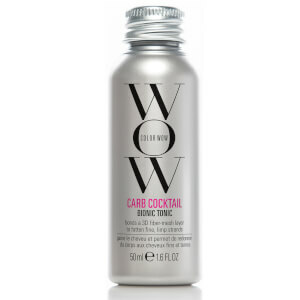 Similar to ironing with starch (which helps to add substance to flimsy fabrics), the tonic lends hair improved body, fullness and hold, all without stiffness or stickiness. Water (Aqua), Glycerin, Polyquaternium-4, Panthenol, Polyquaternium-11, PEG-12 Dimethicone, Silicone Quaternium-18, DMDM Hydantoin, PPG-26-Buteth-26, PEG-40 Hydrogenated Castor Oil, Trideceth-6, Corn Starch Modified, Fragrance (Parfum), Hydrolyzed Quinoa, Phenoxyethanol, Disodium EDTA, Trideceth-12, Hydrolyzed Keratin, Butylene Glycol, Iodopropynl Butylcarbamate, Caprylyl Glycol, Beta Glucan (Oat), 1,2-Hexanedoil, Benzyl Alcohol, Sodium Benzoate, Potassium Sorbate, Citric Acid, Hexyl CinnamalL, Butyphenylmethylpropional.